England are under no illusions as to just how big a task awaits them when they play Ireland in Dublin on Sunday, according to assistant coach Mike Catt. With both teams having won two from two heading into the round three match, it has been dubbed a championship-decider. For Ireland coach Joe Schmidt, he believes a win over England would "be the biggest win we've had so far, without a doubt". Catt took a more laidback approach to assessing where this match stands in the table of importance in this year's championship but labels the challenge "an extremely exciting one" and one they are well prepared for. Ireland are currently unbeaten in seven at home and nine overall and Catt is fully aware of just how hard a task it will be to triumph on Sunday afternoon. "We are under no illusions to what it's all about. We'll just focus on what we can control and those are things like preparing and getting the best out of the players tomorrow afternoon. They've beaten South Africa and Australia in the autumn and they are a formidable side. It'll be exciting." As the various newspapers were being wolfishly devoured on the 08.50 from Heathrow to Dublin, cabin chatter inevitably descended into where the match will be won and lost. A brief summation sees the following factors as key on Sunday: the scrum, George Ford's delayed passing, Jonathan Sexton's kicking, the breakdown, the loss of Jamie Heaslip, the absent Mike Brown, the lineout, the elements and, in one more cynical case, the avoidance of drowning in boredom. And Catt believes there will be more than one defining factor in the match. "Everyone has different points of view. Ireland have a really good balance to their game, they have some dangerous and smart players Conor Murray and Sexton are the in-form nine and 10 in the world at the moment. They control the game exceptionally well. "From that point of view the aerial route with Bowe, Zebo and Kearney is very formidable. They have a very kicking good game. We have to match them and try and get the better of them in certain aspects of our game. "It will be a hugely exciting Test match, two positive sides playing some exciting rugby. It should be a great spectacle." It will be Catt's second match in Dublin as part of the England coaching staff and the team have a good record against Ireland having won their last four. 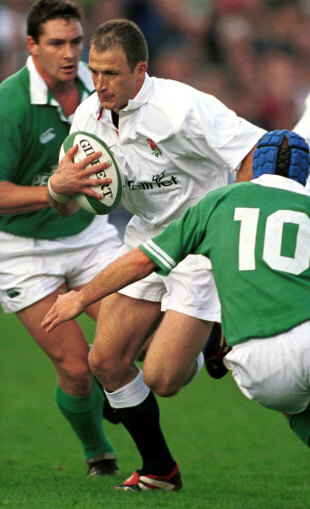 As a player, Catt played two Tests for England in Dublin - both at the old Lansdowne Road - including his first start back in 1995. "My first start was here when Eric Elwood was at 10, gale force winds, peeing down with ran, the ball was put in the air and the Claw [Peter Clohessy] got hold of me. Very memorable moment that, but we ended up winning that one." That 20-8 win over Ireland was the first step in what was to become England's 11th Grand Slam but they are currently in their 12th year since their last clean sweep. But despite being the only two unbeaten teams left in the championship, Catt does not feel Sunday's match will be a simple case of it being a Grand Slam decider. "It's just another very competitive international match that both teams would like to win. Both teams have two games after this one so you can't say the team that wins this will win the Grand Slam or the championship. Like I say, we'll focus on tomorrow and get the best of the boys."